Trump declined to lay out the precise circumstances that could trigger U.S. military intervention in Venezuela, saying only that the option is still on the table. The White House previously warned Maduro that America will respond if violence or intimidation are directed against U.S. diplomatic personnel, opposition members of the National Assembly, or National Assembly leader Juan Guaido, who is now recognized by the United States and its allies as the interim president of Venezuela. President Trump said Maduro asked to meet with him “a number of months ago,” but he denied the request because “we’re very far along in the process” of deposing the dictator. “So, I think the process is playing out – very, very big, tremendous protests,” he concluded. Protests in Caracas on Saturday were indeed tremendous, accompanied by the defection of top Venezuelan air force commander Gen. Esteban Yanez to Guaido’s camp. Maduro is relying on complete support from the military to maintain power, but according to a videotaped statement from Yanez, “90 percent of the armed forces” no longer support the embattled dictator. Yanez rejected Maduro’s “dictatorial authority” in his statement. “To continue order the armed forces to repress the people is to have more dying of hunger and illness,” the general declared. Maduro responded by denouncing the massive protests on Saturday as part of a U.S.-led coup attempt and called for new elections for the National Assembly, but not the presidency. 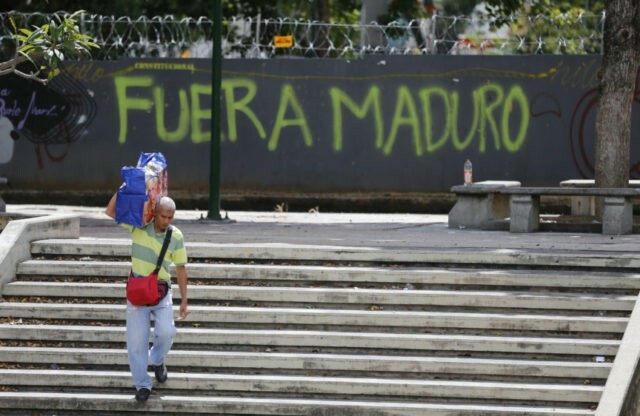 Austria on Sunday joined with German, France, Spain, and Britain to demand Maduro hold new presidential elections. The European countries said they would join the United States in recognizing Guaido as interim president of Maduro does not comply.